Last Monday, we dismantled the exhibition in Museum Meermanno that celebrated the 150th anniversary of Charles Ricketts, 1866 - 2016. 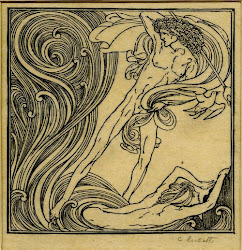 It has been a wonderful experience to install it, bringing together books, autograph letters, prints, and portraits to tell a new story about Ricketts as an illustrator of the Parables and of Oscar Wilde's Poems in Prose. Visitors loved the small but exquisite contents of the exhibition, and of course it was a great honour to show it to Dame Byatt last November. 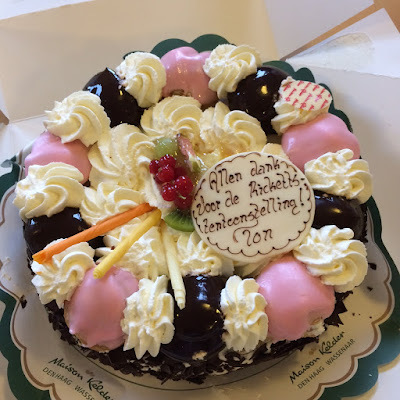 It all ended with a cake for the staff of the museum, inscribed with the name of Ton Leenhouts from whose collection most of the works were on loan.